Cycle along the western coast of Sicily on this self-guided cycling holiday. Discover colourful landscapes as you ride on quiet coastal roads through the countryside. Explore imposing Greek ruins and Favignana Island, a hidden gem in the Mediterranean. Arrival in Marsala and check in to the hotel. Spend the afternoon mingling with the locals as they promenade on marble cobbled streets from one piazza to the next. Today's flat ride takes you to the characteristic Infersa salt flats, a patchwork of shallow coastal lakes and salt pans lined with ancient windmills and home to many migratory birds and a small salt museum (optional). 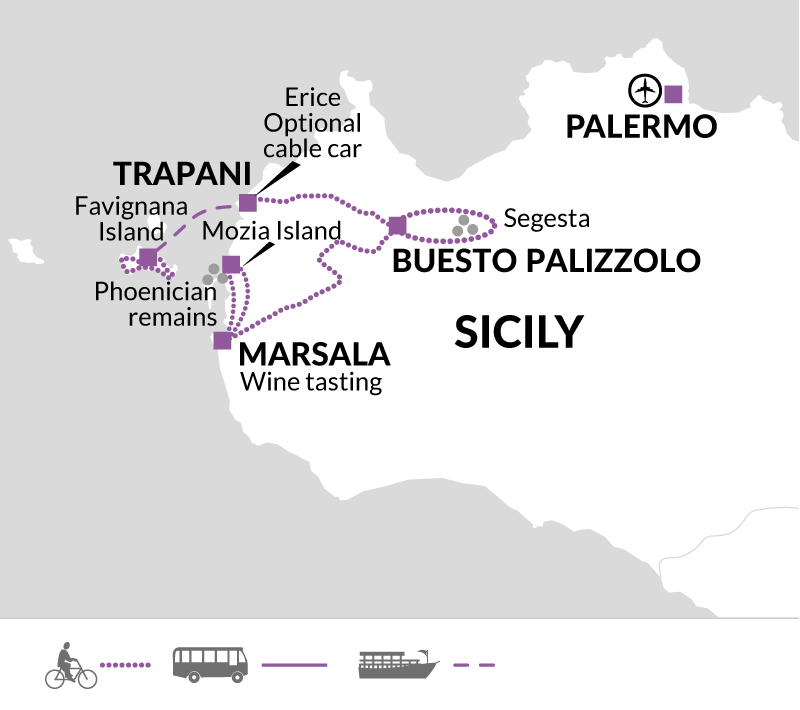 Return by bike, using the same route to the hotel in Marsala and once back in town maybe visit a winery and taste some of the excellent locally made sweet Marsala wines. Leaving the bustling seaside towns behind cycle inland, gradually ascending via a succession of pastures and fields of wheat. For the first part of the ride when leaving Marsala there will inevitably be more traffic and there are some up hill sections. Once away from the coast this sparsely populated, vast expanse of beautiful nature dotted with crumbling, old farm houses is a joy to the eye and a pallet of contrasting colours that change with every season. Spring is ripe with the lush green wheat that turns bronze yellow in summer then ochre and brown as the fields are ploughed. For the next two nights you stay in a small family-run organic farm or agriturismo, located just outside Bruca, serving wonderful home grown and locally sourced Sicilian specialties prepared by 'mamma'. Total cycling distance today is approximately 52 kilometres (Total 620 metres ascent and 300 metres descent). Start the day with a short and easy ride through the rolling hills to the imposing archaeological site of Segesta - an ancient 'Elimian' town. You may start to wonder if you are hallucinating as you see perched on top of a hill overlooking a deep canyon, an unusually well-preserved (though unfinished) Doric temple built sometime in the late 5th century BC. A pleasant walk up the hill past a series of buildings dating back to various periods takes you to the ancient Greek theatre carved into a natural rock hollow. In the afternoon you may wish to continue by bike to some public hot springs. Alternatively you may choose to return directly to the accommodation and relax by the pool in which case you will have cycled a total of 16 km (total 180 metres ascent/descent). After relaxing your muscles in the warm waters, return to the hotel by the same route. Heading back towards the coast today wind your way through the hills and then speed down to the lively city of Trapani where you spend the next two nights. Along the way the ancient town of Erice looms high above and is said to have been founded by exiled Trojans. This was also an important religious site and a famous temple dedicated to Aphrodite (Venus in Roman times) allegedly stood here. After stopping for lunch in Trapani, spend the afternoon enjoying a stroll and people watching along the pedestrianised historic centre. Later this afternoon you may like to take the cable car from Trapani up to Erice. Total cycling distance today is approximately 34.5 kilometres (Total 260 metres ascent and 450 metres descent). This morning take the local ferry (approx. 40 mins and €25) to Favignana island; the largest of the three Aegedian Islands, set just off the western coast of Sicily and well known for its tuna fishing tradition. Cycling its flat coastal roads you will contour the turquoise coloured coves and bays that tempt you to go for a dip before relaxing in the village square, drinking a coffee and watching the locals come and go. There are no cars on the island which makes for peaceful cycling. 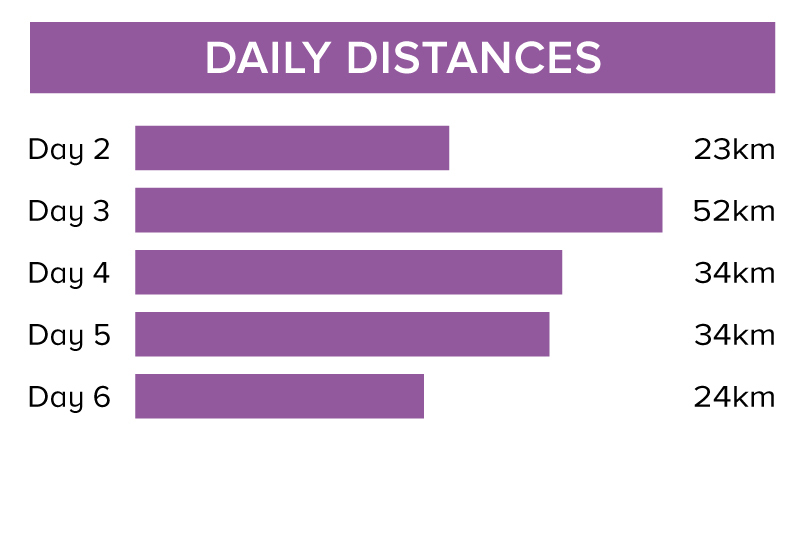 Total cycling distance today is approximately 24 kilometres (Total 40 metres ascent and 40 metres descent). General: Pack layers of clothes essentially for mild or hot weather depending on the time of the year, but remember a warm fleece if travelling at the start or end of the season as the weather can be changeable. If you are not bringing cycle shoes then try to bring stiff-soled shoes as these are better for cycling - transmitting your energy into the pedals more efficiently. This becomes more relevant and recommended the more demanding the grade and distances to cover. SPD cycle shoes are not well suited to trips that combine sightseeing with cycling. On all Explore cycle holidays we strongly recommend you bring along and wear your cycle helmet. In case of an accident resulting in personal injury, certain insurance policies are invalidated in cases where a helmet was not being worn. Cycle glasses to protect against dust, pollen and the sun, padded cycle gloves and a water bottle or water delivery system (e.g. camelback or platypus) are also useful. You may choose to bring your own gel seat cover for added comfort. If a handle bar bag or pannier is not provided (check bike details) then you may like to bring a small rucksack to wear while cycling. Other items to consider bringing are a sunhat and sun cream, torch, earplugs and insect repellent. Please carry some or all of your cycling equipment e.g. helmet as part of your hand luggage. GPX files are available upon request so you can follow the route on your own GPS device, please arrange this before departure. We recommend outbound flights into Catania Fontanarossa airport which is served by both budget airlines (including Easyjet) and non-budget airlines (including British Airways and Alitalia). For this trip you can fly into and back from Palermo or Trapani airports. From Palermo airport it is a 1 hour 20 minute drive to Marsala from where the trip starts. Trapani to Marsala is a 25 minute drive. More detailed instructions and links to timetables can be found in the trip Destination Manual which will be sent to you several weeks before your holiday. On this trip cycle 167 km over five days (an average of 33 km per day) with further optional rides available. Two of the cycling days are circular routes and therefore optional. We travel mainly on quiet country roads, mostly on the flat with hillier terrain on days 4 and 5. We have graded the route as easy to moderate. Your included bike is a 21 gear Atala Discovery hybrid and will be the correct frame size for your height. A pannier and water bottle holder (male frame only) are included as well as the facility to fit your own pedals or saddle if you wish to bring them. All you need to bring is your own helmet. Tue 19 Mar 2019 - Thu 25 Apr 2019 Your trip can depart anytime between the above dates. Contact us for triple room requests and solo traveller prices. Fri 26 Apr 2019 - Wed 22 May 2019 Your trip can depart anytime between the above dates. Contact us for triple room requests and solo traveller prices. Thu 23 May 2019 - Fri 21 Jun 2019 Your trip can depart anytime between the above dates. Contact us for triple room requests and solo traveller prices. Sat 22 Jun 2019 - Fri 19 Jul 2019 Your trip can depart anytime between the above dates. Contact us for triple room requests and solo traveller prices. Sat 20 Jul 2019 - Fri 26 Jul 2019 Your trip can depart anytime between the above dates. Contact us for triple room requests and solo traveller prices. Sun 1 Sep 2019 - Mon 30 Sep 2019 Your trip can depart anytime between the above dates. Contact us for triple room requests and solo traveller prices. Tue 1 Oct 2019 - Thu 31 Oct 2019 Your trip can depart anytime between the above dates. Contact us for triple room requests and solo traveller prices. Fri 1 Nov 2019 - Sat 30 Nov 2019 Your trip can depart anytime between the above dates. Contact us for triple room requests and solo traveller prices. Sun 1 Mar 2020 - Wed 18 Mar 2020 Your trip can depart anytime between the above dates. Contact us for triple room requests and solo traveller prices. Thu 19 Mar 2020 - Sat 25 Apr 2020 Your trip can depart anytime between the above dates. Contact us for triple room requests and solo traveller prices. Sun 26 Apr 2020 - Fri 22 May 2020 Your trip can depart anytime between the above dates. Contact us for triple room requests and solo traveller prices. Sat 23 May 2020 - Sun 21 Jun 2020 Your trip can depart anytime between the above dates. Contact us for triple room requests and solo traveller prices. Mon 22 Jun 2020 - Sun 19 Jul 2020 Your trip can depart anytime between the above dates. Contact us for triple room requests and solo traveller prices. Mon 20 Jul 2020 - Sun 26 Jul 2020 Your trip can depart anytime between the above dates. Contact us for triple room requests and solo traveller prices. Sun 1 Nov 2020 - Mon 30 Nov 2020 Your trip can depart anytime between the above dates. Contact us for triple room requests and solo traveller prices.